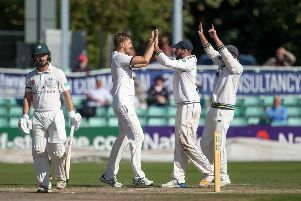 While Hampshire’s Division One safety was secured earlier in the match, the eight points gained by Yorkshire leaves them within touching distance of avoiding relegation. The White Rose county need a maximum of only two points from next week’s final round clash with bottom side Worcestershire at New Road. That is assuming second-bottom Lancashire get a haul of 24 points in their meeting with Hampshire at the Ageas Bowl. Heavy rain from lunchtime onwards yesterday (day three) and through the night in the Headingley area meant the outfield was unfit for play on day four. Further showers blew across the ground through the morning before umpires Michael Gough and Graham Lloyd called an early lunch at 12pm and then abandoned immediately. We came into this game with a lot of confidence, and I want us to jump on the back of that. Before the rain, we were in a commanding position. Both sides claimed eight points from the draw. 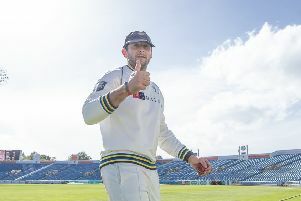 Hampshire sit fourth in the table and Yorkshire fifth. Had play started, Yorkshire would have been 287-5 in their second innings, leading by 314. Opener Adam Lyth’s 134 not out represented the highest score of the match, although he was dropped twice by sub wicketkeeper Aneurin Donald yesterday on 80 and 94. The next best score was Jonny Tattersall’s 43. “I thought it was a good solid week,” said Yorkshire coach Andrew Gale. “We spoke before the game about how we’re probably playing our best cricket of the season towards the back end, and we’ve got some confidence back. We had a good solid draw at Trent Bridge and then beat Lancashire in a close battle. “We came into this game with a lot of confidence, and I want us to jump on the back of that. Before the rain, we were in a commanding position. “I’m really pleased that we’ve backed up some good work last week, and that’s the first time this season we’ve managed to do that.